Microdermabrasion ( skin polishing ) is a cosmetic procedure that uses a mechanical medium for exfoliation to gently remove the outermost layer of dead skin cells. Microdermabrasion is a painless, non-invasive, skin rejuvenation procedure using a combination of a fine abrasive diamond tip or aluminium oxide crystals and a vacuum suction applied to the skin. Typically there are no needles or anesthetics required. The vacuum pressure and speed are adjusted depending on the sensitivity and tolerance of the skin. 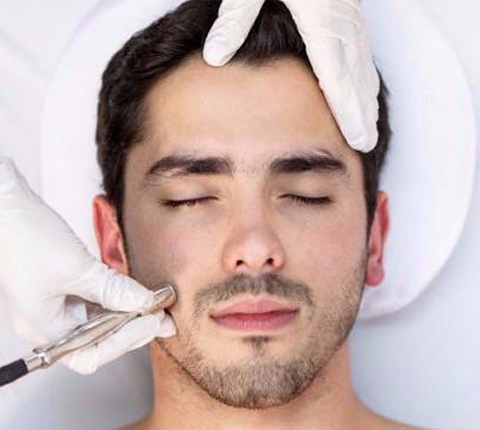 A non-surgical, non-chemical, non-invasive skin resurfacing method utilizes fine crystals to exfoliate & rejuvenate the dead superficial layer of skin. How does the treatment work ? Skin is washed to remove excess oil & dirt. A stream of fine aluminium oxide crystals is delivered to the handheld probe via vacuum gentle streaks are made over the skin with the probe in specific patterns. This abrades away old, dead cells picked up by the vacuum by suction. Builds up collagen- an abundant skin protein rejuvenates skin. How many treatments are required ? In general 6 – 8 sessions spaced a month apart is recommended Pimple marks and scars require more sessions. Maintenance treatments once in 2 or 3 months for long-lasting results. It is a very common and safe procedure non-traumatic initially patient may feel a mild scratching effect as the crystals make contact with the skin mild dryness can occur depending on the patient’s skin type which can be tackled with moisturizers. Mild redness can occur with some patients with severe scars as aggressive abrasion may be required in such cases, redness lasts only for half to an hour patient has to refrain from using makeup to allow the skin to breathe & regenerate by itself. Is there any downtime ? No downtime unlike laser resurfacing to allow time for healing & recovery you can return to your normal routine immediately after the procedure, hence it is called “ LUNCHTIME FACELIFT” as it gives an instant flushed look (polished look) particularly suitable for working people who can’t take off from work. How soon will the results appear & how long do the results last ? The results are immediately noticeable with subsequent sessions the results keep improving. The effect lasts for 3-4 weeks post-treatment care is essential and it greatly influences the results.